Enjoy a story of family lost & found! Discover a message in a bottle that changes Emily's life forever, while cooking divine dishes in Italian kitchens! Now that Paige has fully recovered from her fever, life has settled down again in Snuggford. That is until, the entire Napoli family hears that Emily's missing "Grappa", Vitto, is still alive and might be in Italy! Emily's father, Edward, is overwhelmed by the news. He and his four brothers haven't seen their father, or each other, in years. 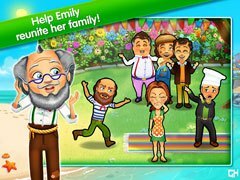 Reuniting them is going to be quite a challenge... Will Emily succeed in bringing everybody together at the big family dinner? 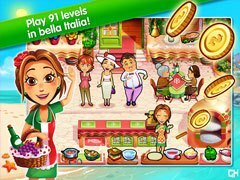 - Run 8 Italian restaurants with Emily! - Cook over 200 authentic Italian dishes! 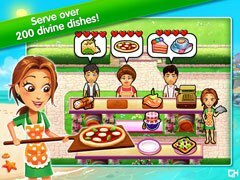 - Collect 14 special trophies with messages from real fans of Delicious! - Send out invitations to everyone!